The rear of the home is perhaps the most conventional view of the home. But it also shows the unique brick roof. This kind of roof material is even more surprising when set against a ground floor made almost entirely of glass walls. In visual terms this could very easily feel top heavy. But the architects has broken up the glass planes with dark black support beams. A broad outdoor area balances the effect. The home has a peaked roof of grand dimensions. The second level has a gentle slope that runs a little lower to the ground than normal. As mentioned earlier, the facade has been split in two by narrow windows that run from floor to roof. The unique appearance of the shell-like facade is accentuated by the use of brick. 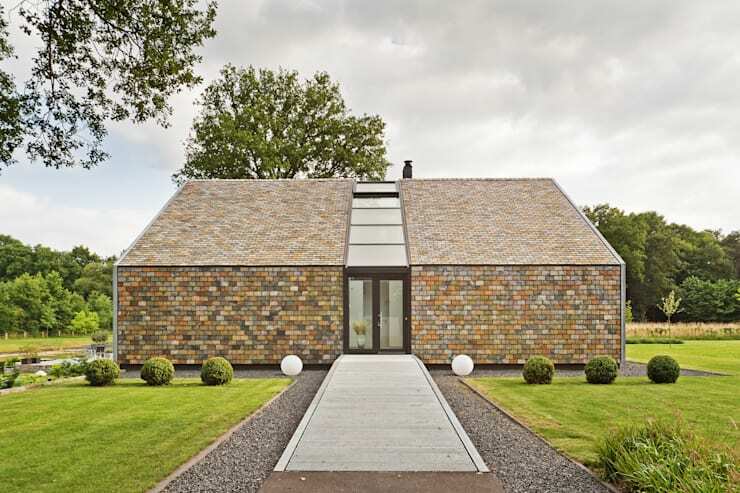 It's very rare to see brick used in a modern shell-facade and it's even more unique to see a brick roof. The interior has one broad passage space that also functions as a dining area. The living room is set off from this and surrounded by walls on three sides. This gives it a very cosy feel within the large and otherwise open social area. 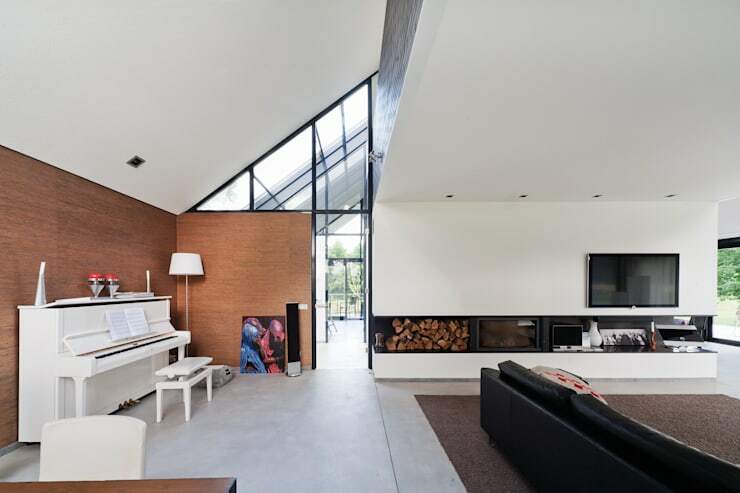 Note how the peaked roof creates space for a double-height living room. 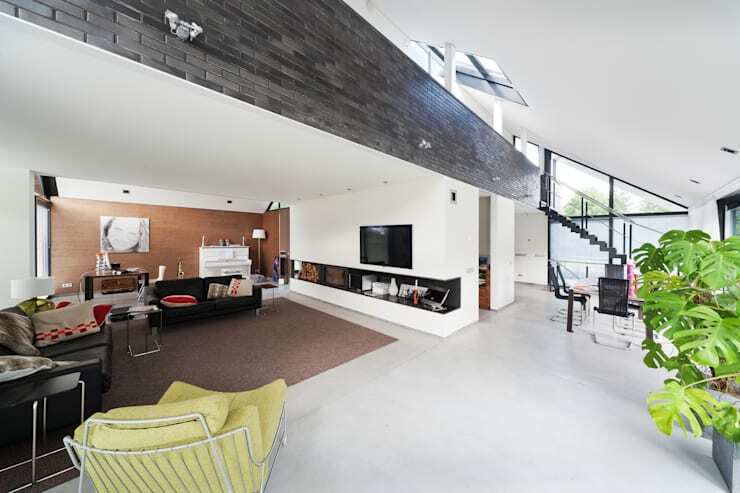 It also forms an interior space well suited to a bold mezzanine. The beautiful triangular ceiling is a real eye-catcher in the living room. Internal windows with black frames really jump out in the otherwise white space. They encourage us to look upwards and accentuate the height and shape of the ceiling. From this angle, we can also see how the living areas have been separated into zones with the help of two parallel passageways. Modern homes are all about big bold uninterrupted lines of sight. This creates a feeling of expansiveness and freedom within the home. Here in the living room we can see just how effective this kind of approach to design can be. We love how the storage space for the wood has been inset into the wall. It accentuates the long lines of the room and further expands the sense of space. One of our favourite rooms is the bathroom. 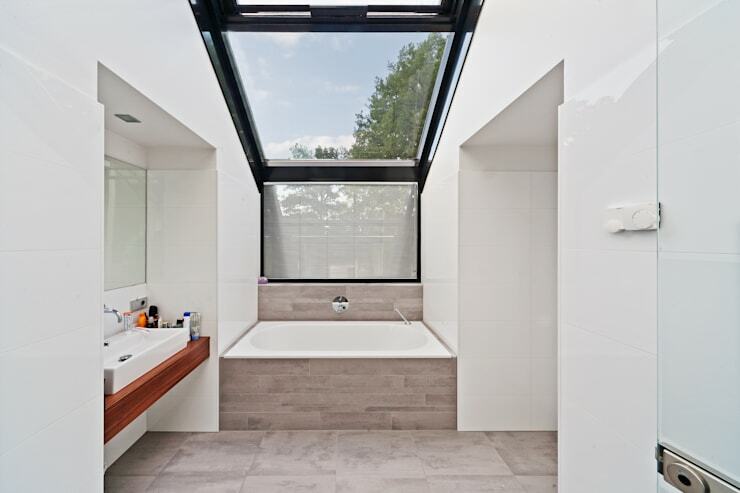 The roof light or skylight creates the perfect well of light. It also provides an attractive outlook for anyone soaking in the big bathtub. But in a bold modern home like this, it's often the simple things that also need to be appreciated. We love how the washbasin area has been inset into the wall and shaped to perfectly mirror the doorway on the right. 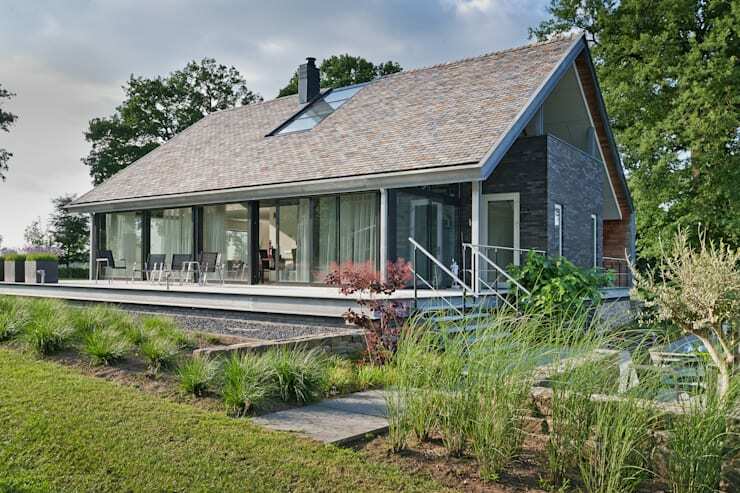 For more home inspiration, have a look at The gabled home you've always dreamed of.